Henry Sotheran Ltd: Upcoming catalogues: a sneak preview. Upcoming catalogues: a sneak preview. We have several catalogues currently in the production stages at Sotheran's. Far & Wide, our latest travel catalogue, is expected to return from the printers this week, shortly to be followed by Women of Influence - a fascinating collection of books by, or related to, inspirational women in literature, art, and the social arena. Further catalogues from the Fine Prints and Architecture departments are scheduled for the coming months. Starting with Travel, we have decided to bring together a few highlights in the blogosphere - showcasing some of the most exciting stock to feature in the upcoming catalogues and giving our readers a first glance at what's to come. GREENOUGH, George Bellas. General Sketch of the Physical and Geological Features of British India. 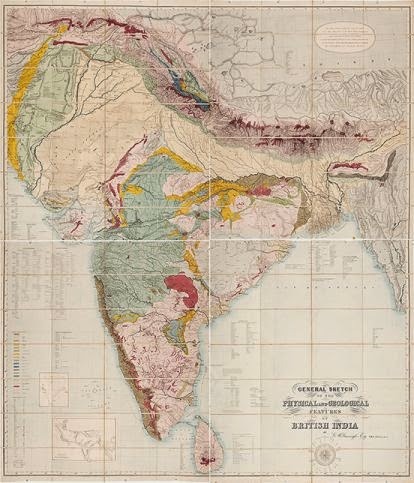 Greenough's geological map of India, the first to cover the whole of the subcontinent in its entirety, is perhaps one of the most visually striking items to appear in the catalogue. Despite never visiting India himself, Greenough managed to produce this highly detailed map through correspondence with fellow geologists and military figures, using their observations in the field alongside information from his own library. The East India Company began to build the first railways in India in 1850, and, five years later, Greenough's map met the vital demand for accurate geological information - key to aiding the engineers working on the railway and to determining the mineral wealth of the continent. BICHURIN, Iakinf. 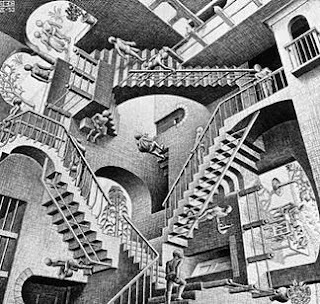 Kitai, ego zhiteli, nravy, obichai, prosveshchenie. St. Petersburg, printer of the Imperial Academy of Sciences,1840. 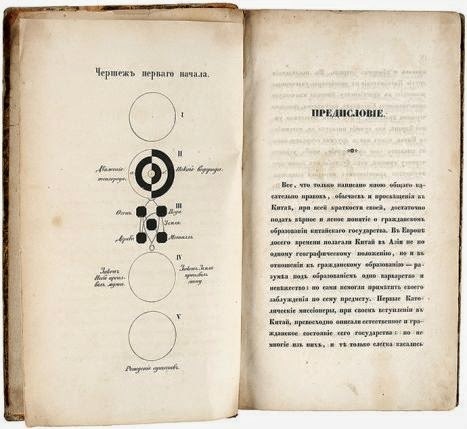 Also of great cultural significance is this Russian curio, a very rare first edition of China, her People, Character, Customs, Erudition, by the Russian monk and sinologist, Nikita Yakovlevich [Iakinf] Bichurin. This book is a landmark in the establishment of cultural exchange between China and Russia, offering a deep insight into Chinese belief systems and the language. It includes chapters on statistics, education, everyday life and ceremonies, government and administration, publishing, and foreign attempts to get a foothold in Chinese politics and trade. STANLEY, Henry Morton. Commemorative gardening tools, presented to Stanley. From the curious to the curiouser, these commemorative gardening tools form part a collection of unique objects from the estate of the African explorer, Henry Morton Stanley. 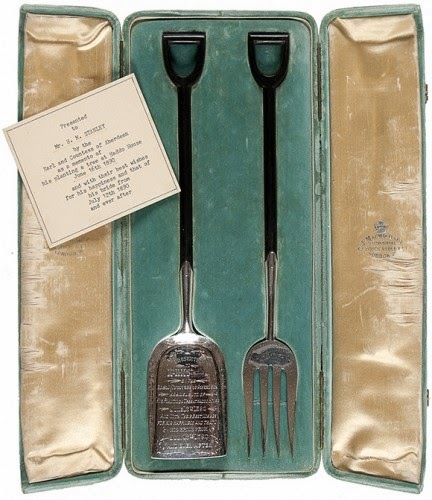 The miniature spade and fork were custom made to a unique design and presented to Stanley as a wedding gift. 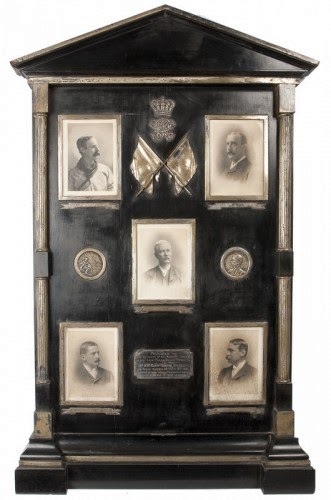 The inscription reads 'Presented to Mr. H.M. Stanley from the Earl and Countess of Aberdeen as a memento of His Planting a Tree at Haddo House June 16th 1890 and With Best Wishes for his happiness and that of his bride from July 12th 1890 and ever after'. Commemorative wall panel, presented to Stanley. If you would like to receive a copy of Far & Wide, which includes an early road map of India and more unique objects from Stanley's estate, then please click here.